Filled with a summery berry jam and rolled in sugar while still warm, these are the ultimate treat. 1. Warm the milk in a saucepan over a medium heat until little bubbles start to appear and the milk is warm. Take off the heat and add the butter, stirring until melted. 2. Put the flour, yeast, sugar and salt in a large bowl and stir in the egg. Make a well in the middle and pour in the milk mixture, stirring together with a cutlery knife. Knead for 2 minutes in the bowl, then tip onto a lightly floured surface and knead for 8-10 minutes, until soft and smooth. Put into a lightly oiled bowl and cover with lightly oiled cling film or a clean tea towel. Leave to rise somewhere warm until doubled in size (about 50 minutes to 1 hour). 3. Meanwhile, make the berry jam. Put all the ingredients into a heavy-based saucepan over a medium heat, and put a plate in the freezer. Stir until the sugar dissolves, then increase the heat and boil for 6 minutes, without stirring, until set. To test, drop some jam onto the chilled plate, leave for 10 seconds and then run your finger through it; it should wrinkle and hold its shape. If it hasn’t set, boil for 1 minute more and test again. Remove the jam from the heat, cool for 5 minutes, then scrape off any scum from the surface and leave to cool completely. 4. When the dough has risen, knead for 1 minute, then divide and roll into 12 equal-sized balls (use scales if you want to be precise). Spread them out about 3-4cm apart on a lightly oiled tray and cover loosely with lightly oiled cling film. Leave to rise in a warm place for another 30 minutes, or until doubled in size. 5. Heat the oil in a deep, heavy-based pan (it should be no more than half-full), or use a deep-fat fryer. Heat the oil to 180 ̊C (use a sugar thermometer, or drop in a piece of bread: it should turn golden in 45 seconds). Carefully add 2-3 doughnuts using a slotted spoon. Fry for 2 minutes before turning and cooking for 2-3 minutes more – they should be golden on both sides. Remove and drain on kitchen paper; repeat with the remaining dough. 6. Pour the sugar onto a tray. When the doughnuts are cool enough to handle, roll them in the sugar. Use a cutlery knife to make a slit in the side of each doughnut, wiggling it around to make a hole in the middle. 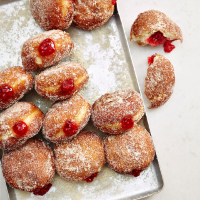 Put the jam in a piping bag and fill each doughnut until it starts to swell. Coat with a little extra sugar, if liked, and enjoy slightly warm.